A ghost story and of wanting to believe. "Emma, what are you staring at?" Turning on the bedroom light, the mother of the three year old stood in the doorway, puzzled by her daughters intense attention to the open space she was gazing at as she held to the edge of her crib. Frowning, she came to her, standing by her, "Emma?" Following the little girls eyes to the nothing that was there, she searched for something to make rational sense of toddlers odd behavior. "Not again..." And the crayon drawings she was given by her daughter, always held a specteral smile upon a face that was undefined and hard to realize.The single mother would worry of why and what it meant. Then as a teen came the paintings, one after another, the soul inspiration, a single vision, that of an artist. Greys, greens and shades of black were the colors placed upon the canvas. 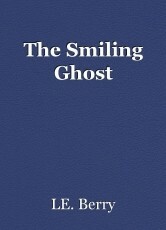 With the smiling specter always found, not in the foreground, but sighted only when the viewer would step back. And the psychiatrists and psychologists consulted, all said 'Emma is expressing her delusion, and the outlet of art is to her benefit when it comes to her mental health. And with that assuring diagnosis, she was allowed to continue. Thoughout her lifetime, fame and fortune were never hers, but she always had what she needed to endure. And it would seem to many that Emmas life of solitude had created the world she would inhabit. Her mother died at the age of seventy-five. It might be thought perhaps, that in Emmas final years, that she was utterly alone, except she wasn't, for she always had by her side the company of the smiling ghost. © Copyright 2019 LE. Berry. All rights reserved. A Knights Loyalty, Worth More Then A Knights Life. This page was created in 0.3629 seconds.